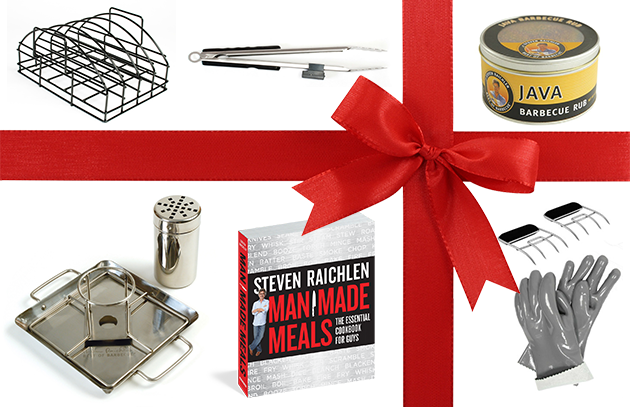 Stainless Quesadilla Basket, Beer Can Chicken Roaster, Ultimate Rib Rack, Lumatong, Food Glove and Meat Claws Set, Ultimate Suede Grilling Gloves, Infrared Grill Thermometer, Grill Grid Lifter, Best of Barbecue All-Purpose, Java, and Mediterranean rubs, and Man Made Meals: The Essential Cookbook for Guys. Click on any of the items to learn more about it. And be sure to check out 10 Indispensable Gifts for the Griller in Your Life for more inspiration. NO PURCHASE NECESSARY. Open to US residents of the 50 states and Canada, age 18 years as of December 5, 2014. Sweepstakes begins at 12:01 a.m. Eastern Time (ET) on 12/5/2014 and ends at 11:59 p.m. ET on 12/17/2014. For official rules, click here. Void where prohibited. Now that you know what you’re getting for everyone on your list (or what you’ll be asking for from them! ), kick back and relax with a smoky Pulled Pork Sandwich and enjoy the weekend.